Keith Farmer completed a double at Silverstone to tighten his grip on the Dickies British Supersport Championship, with Andrew Irwin (left) twice finishing as the runner-up. 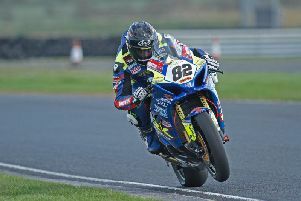 Keith Farmer secured a brilliant double in the Dickies British Supersport Championship as the Ulster rider took a huge step forward in his bid to win a third title. The Appleyard Macadam Yamaha rider is now 103 points clear of closest rival Jack Kennedy, who crashed out of race two on Sunday in the wet. Keith Farmer leads Jack Kennedy and Andrew Irwin at Silverstone. Only three rounds of the championship remain and Farmer, who won the British Superstock 600 and 1000 titles in 2011 and 2012 respectively, now has one hand firmly on the Supersport trophy. On Saturday, he prevailed in a gripping Sprint race to hold off a determined challenge from Carrick’s Andrew Irwin on the Gearlink Kawasaki, who lost out on his maiden Supersport win by only 0.045s on the line. There was contact between the pair as Farmer attempted a pass in the closing laps, which left Irwin feeling slightly aggrieved afterwards. Irwin said: “It was a good race and it was probably the first time I’ve rode in those conditions, but it was enjoyable. I just thought I’d sit behind Keith and then I passed him, and he did a pass that everybody saw on TV. Farmer, though, begged to differ, dismissing the clash as a racing incident. “I particularly don’t think it was a hard move and that’s racing,” he said. Irwin’s team-mate, Ben Currie, was also right in contention for the win as he finished only 0.176s back in third. Kennedy was sixth, with David Allingham in ninth on the EHA Racing Yamaha. In torrential rain in the Feature race, Farmer was left clear for his second win of the weekend when Kennedy crashed out moments after taking the lead on his MV Agusta. Irwin bagged another runner-up finish as he finished 19 seconds in arrears, with Allingham taking fourth behind Arthur Sissis. It was a dream weekend for Cumbria-based Farmer, who has turned his fortunes around in commendable style after being left without a ride at the start of 2017. Farmer, who has now won the last four British Supersport races on the trot, said: “We were lucky to bring it home because we had a few big moments and I just let everyone find the grip. “I knew Ben [Currie] went off at the start and then we started to catch him. I had a couple of massive moments after hitting white lines and it was just about basically staying on and trying to finish. “Once Jack came past me I just thought I’ll bring it home behind him and it’s not the end of the world, but he obviously thought I was coming to come back at him and he was too eager on the power and unfortunately for him he lost it,” he added.